It’s Memorial Day weekend! A time when most kids are thrilled to be officially out of school and a time for adults to have a much needed three day weekend! It’s also a time to get the patio cleaned up and to dust off the grill. So while out running around getting all the barbecue supplies, trying to remember everything we need, remember why we have this weekend. So take time to raise the American flag, stop and buy a poppy, and offer a moment of silence to say “Thanks” to those who lost their lives while serving our country. Barbecues are great for leftovers. It is such a good time to cook a “little extra” but also for what is usually leftover after a barbecue-cole slaw or coleslaw. (However you prefer to spell it, both correct!) 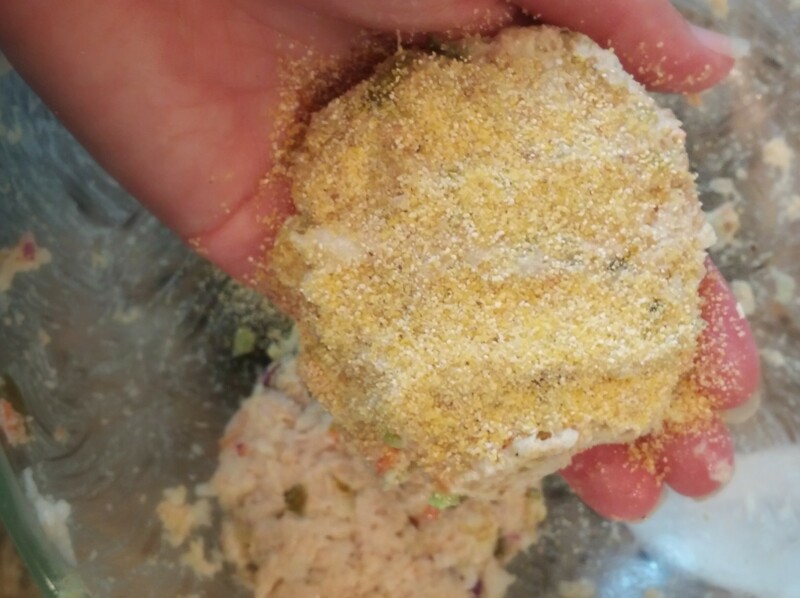 One of my favorite things to do with cole slaw is to use it to make salmon burgers. I know cole slaw and salmon are an unusual couple, but give them time to convince you otherwise! 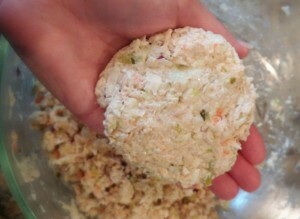 Cole Slaw Salmon Burgers: In a bowl, put contents of 1 foil pouch (5 oz) of boneless salmon and separate with a fork. You can certainly use fresh salmon for this recipe, but this salmon was on sale and I can’t pass up a bargain (just ask my hubby!) Use your favorite cole slaw. 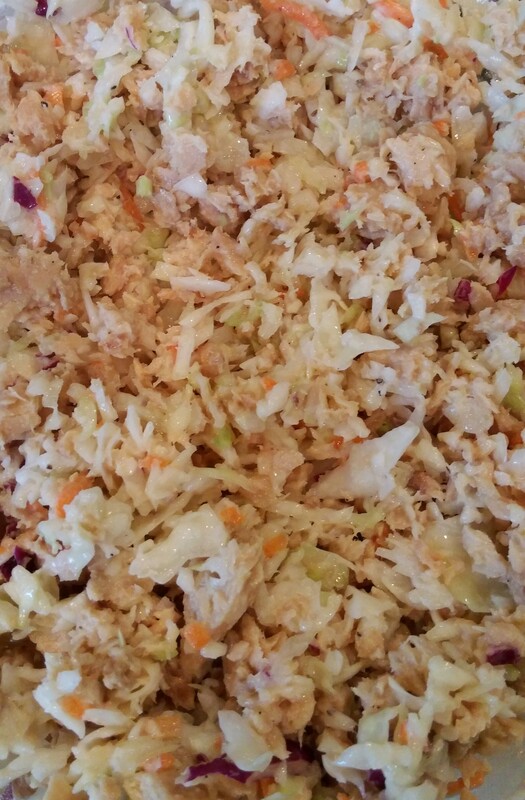 If you like your cole slaw grated, instead of shredded, you are one step ahead! 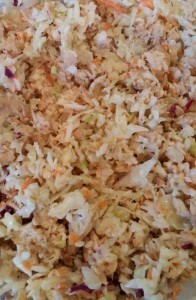 If not, place 1 cup cole slaw into food processor and give a few quick whirls. 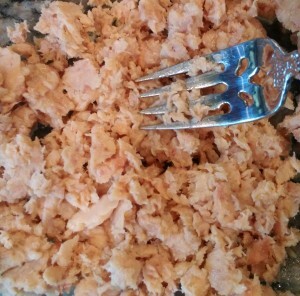 Add the grated cole slaw to the salmon. See, looking better already! Fold in 1 TBSP mayonnaise and 1 TBSP pickle relish, dill or sweet (another leftover you should have from your barbecue!) and juice of 1/2 lemon or 1 TBSP white wine, (if your cole slaw is vinegar based, use less) then add 1/4 cup breadcrumbs. If not already an ingredient in your cole slaw, add 1/4 tsp celery seed and black pepper to the mixture. In a separate bowl, mix 1/4 cup of cornmeal to 1/4 tsp Cajun or Creole seasoning. Set aside. Dampen hands and form the mixture into 4 patties. Each will be a little under 1/2 cup. I like to keep all my patties in my working bowl until the next step. 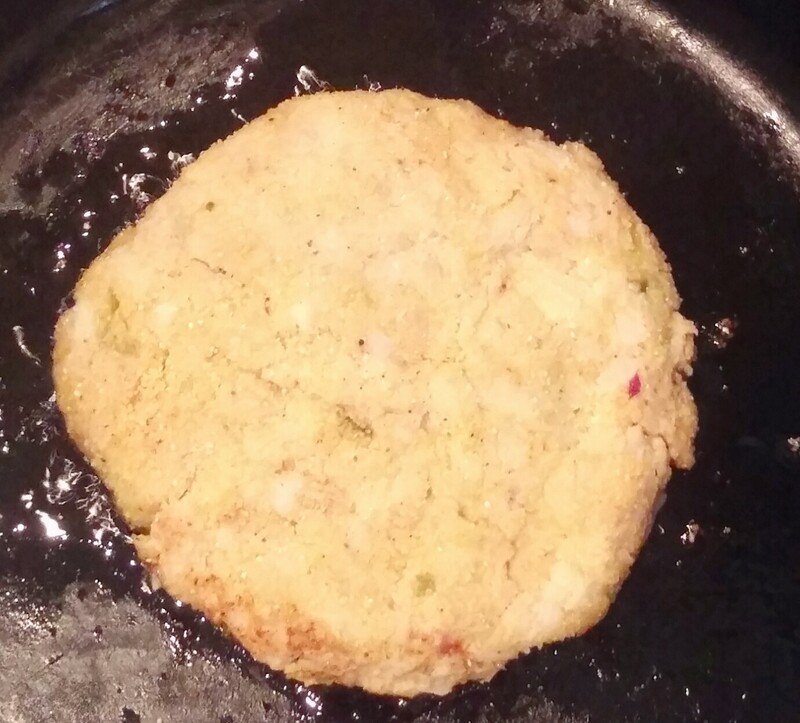 Take each patty in your hand and sprinkle the cornmeal mixture over each side of the patties. Let excess fall on those patties below. Set patties on a wax paper lined plate and put into refrigerator at least 1 hour. You can bake the patties for 15 minutes in a 375 degree oven (just give each a quick spray of non-stick spray) or you can pan fry in a little olive oil. I like the pan fry method best especially with the cornmeal crust. 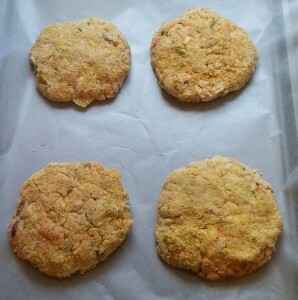 It reminds me of the old-fashioned salmon croquettes my memaw used to make and the good old fashioned kind that still pop up in cafeterias or family diners from time to time! Drizzle a little olive oil in a cast iron skillet over medium high heat. Put the patties in the skillet and give each one a GENTLE press. Do not touch and let the patty fry for 3 1/2 minutes on first side. (This is the key to not having the patties fall apart!) Flip and pan fry patties for additional 3 to 3 1/2 minutes. Remove from heat. That’s it! Eat like a burger and dress however you wish. 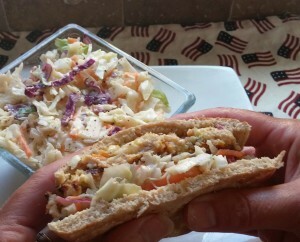 I like a little layer of cole slaw (since I still have some leftover!) and fresh sliced tomatoes. Get creative with your toppings. 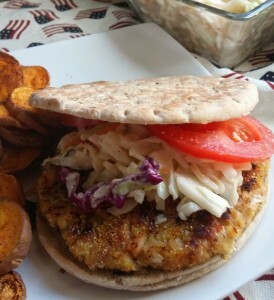 The patties are also good in a wrap or stuffed in a pita pocket with some more cole slaw. Put your TO COOK IS TO CREATE thinking cap on: Instead of cornmeal, what other coatings could you use? Breadcrumbs, of course, but how about ground pecans or peanuts or crispy chow mein noodles! 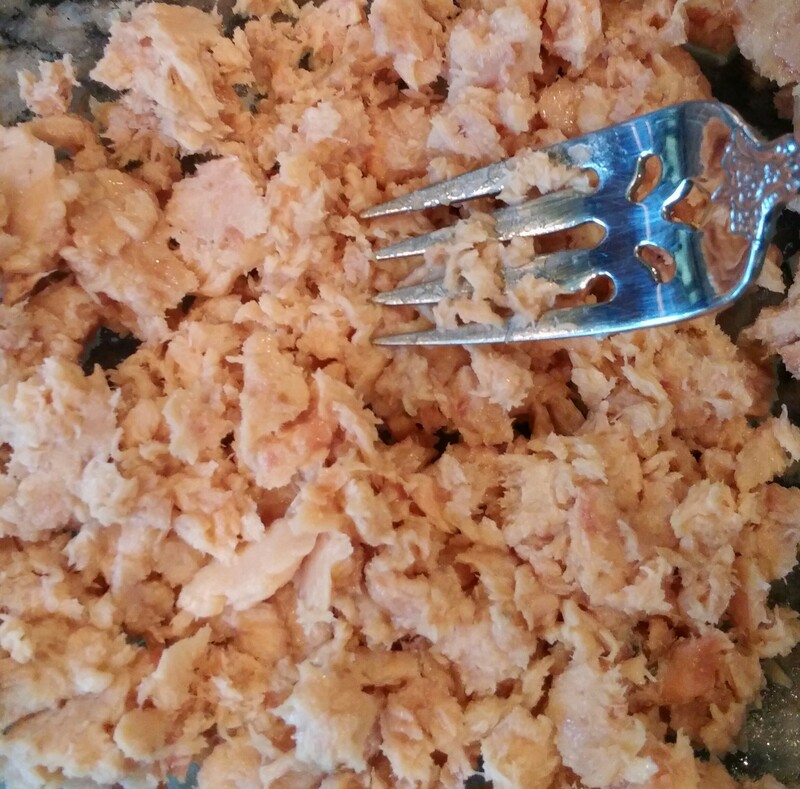 What else would be good in the salmon mixture? How about pickled jalapenos instead of the relish? What else could you grate with the cole slaw? Onion or bell peppers? What other seasonings could change the flavor? Garlic? Cumin? Chinese five spice is a good one. Like a spread for the bun? Creole mustard and mayonnaise? Remoulade? Don’t like salmon at all? Substitute chicken or tuna! FOOD FUN: Are you barbecuing this weekend? Is it your first cook out of the season? Well, good news for firing up your pit, May is National Barbecue Month! Isn’t the smell of a barbecue hard to resist? Think about the glorious smell wafting through your neighborhood. Now think about a neighbor who you can invite over for the cookout. Anybody that lives alone? How about a couple you would like to get to know better? How about the one that picks up your mail while you’re on vacation? The more the merrier and let’s face it, when is there never enough to eat at a barbecue?! I will be making these!! Great Post! Certainly enjoyed the recipe for your salmon/cole slaw burgers. They certainly do look delicious….like the pita bread too. After the barbecue today….it will be salmon/cole slaw burgers for us!